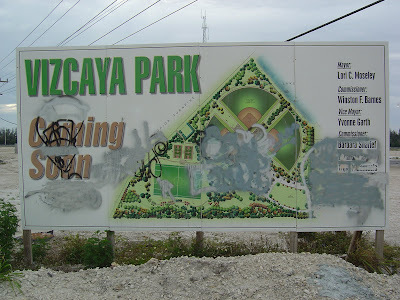 I'm willing to bet a lot of you don't know anything about Vizcaya Park in Miramar. 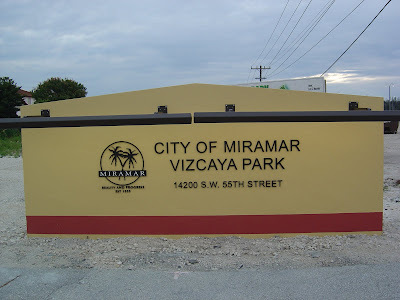 At the end of Honey Hill Drive after you cross over Flamingo Road going west, you will hit a dead end after passing all of the Vizcaya communities on your right. That dead end used to be a huge desert with nothing but a giant radio tower on the far side. 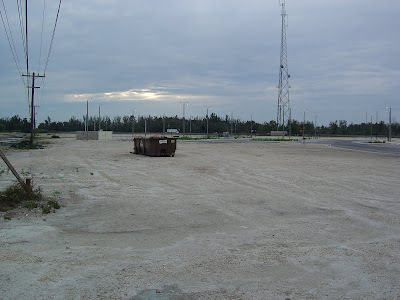 The field was rocks and sand and was contained on the far side by the Florida Turnpike. The field was also apparently a good place for losers to dump their old mattresses and tires and furniture because there used to be a huge pile right at the end of the road. Here are a few remnants of the bad old days! Personally, it was an awesome place to go kite flying with my kids. A big wide-open space just a few minutes from my house. Terrific! But one day, they put up a chain-link fence across the road so no one could easily access the field by car (perhaps to stop the dumping). Workers began to clear all of that garbage and put up some signs. They put in a couple of roads and street lights, but then the work stopped. Maybe the stoppage is due to the economy, but it sure would be wonderful to have a new park there. I can't wait for it to be done! Let me know if you have more specifics. The city lists it as a park, but for now, there is no reason to go! 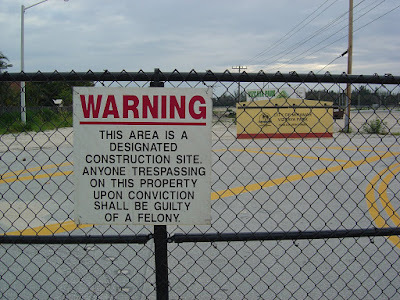 Surely you don't need this sign to tell you not to jump over chain link fences into a construction zone, but the threat of a felony should help you make up your mind. Besides, I already took the pictures for you. Wait until they are done! It seems that some people got angry that their dumping ground got replaced with a sign announcing that a park was going to take its place. They took their frustration out on the sign with a can of spray paint and poor graffiti skills. The sign is literally right where a mountain of trash used to be! Update 8/18/2010: I drove down to the chain-link fence in front of this park a couple of days ago. Nothing has changed, not even one rock moved. Update 1/25/2011: I posted another little bit of information. 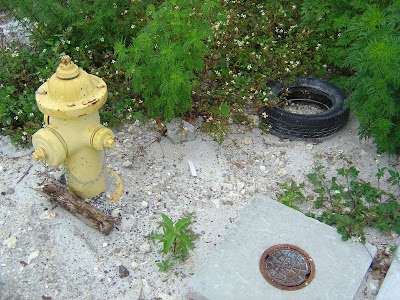 Update 5/9/2011: I started another blog to chronicle the building of this park and provide information about its amenities once completed. 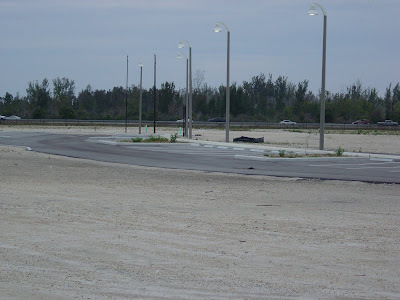 Here are the initial roads and street lights. That's the turnpike in the background. You can see the radio tower here that used to stand alone in this desert. American Flag facing turnpike should be upgraded. It's way too small for the pole it is hanging on. Additionally, as I drove by today, it's all tangled up. I'm just a resident. I don't work for the City. However, I will try to let someone know about that issue.